Back in 2000s the cryptocurrency niche was a terra incognita, the existence of which was not yet known to human. In 2008, someone calling oneself Satoshi Nakamoto set foot on it and brought Bitcoin and the very first blockchain into being. It’s been quite a few years since the day of cryptocurrency inception. It may be you, who’ll push the niche forward with your business. However, to make it to the top, you can’t go without a new-gen cryptocurrency website. 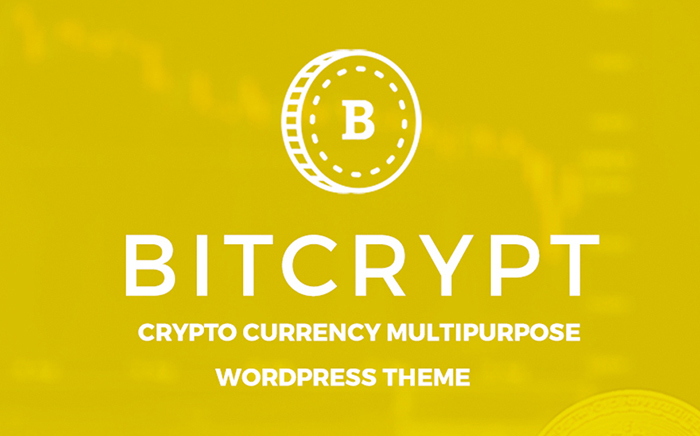 So, we present you top 10 cryptocurrency WordPress themes to power it. What Aspects Should You Account For When Choosing a Cryptocurrency Theme? First of all, decide on the CMS that you’d like to work with. You need the engine that serves best for blogs and corporate websites, and also allows adding some e-commerce functionality on top. Such a website engine is WordPress, the most popular and comprehensive website engine in the world. WordPress is used by more than 30% of all the websites in the world and is an absolute leader among CMS platforms that are out there (find out more here). You’ll appreciate simplicity and extendibility of WordPress that has it all handy in its admin panel. Secondly, think of the color scheme of your preference. The most effective color schemes for cryptocurrency templates are using the shades of blue that highlight your reliability and professionalism, and shades of orange/gold/red that fill your website guests with optimism that comes from the sense of security. Choose the color palette that best fits your corporate identity and your vision of the ideal website. Thirdly, mind user-friendliness and functionality. You need the theme that makes your website a true pleasure to surf on different devices, navigate, learn about different services you provide, and buy, sell and exchange with you. 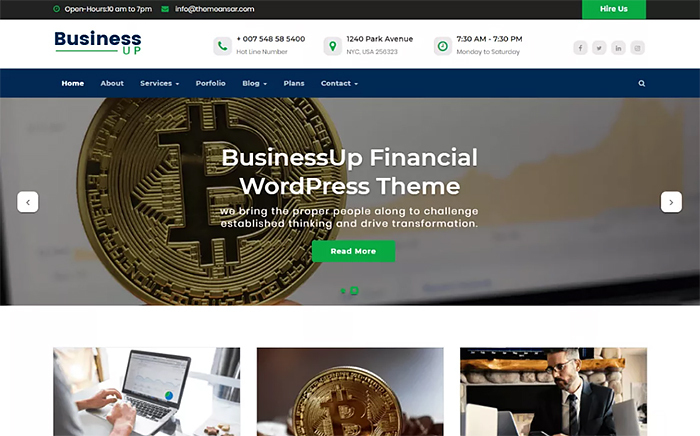 Modern finance WordPress themes will amaze you with their functionality. So, don’t miss a chance to get one of them! 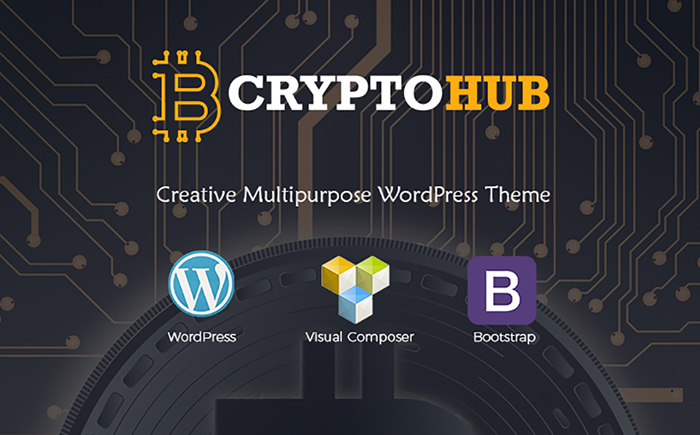 In this post, we share with you 10 modern cryptocurrency themes that we find ideal for creating a cryptocurrency/Bitcoin website. These themes are available to you thanks to TemplateMonster, one of the leading marketplaces in the template market. To experience all the greatness of the templates they offer, see the full collection of their top themes for WordPress. Take your time to experience some of the best cryptocurrency templates on the market, and we hope you’ll be able to find the one that works best for you! By the way, don’t forget to check out the Live Demos of the templates to see their grandeur in real time. 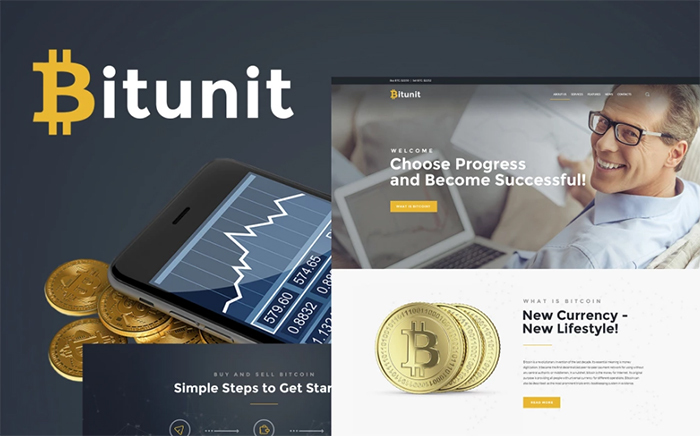 With an unforgettable flair of professionalism to it, BitUnit template is the one that lets your advanced apprehension of cryptocurrency market shine through. The richness of content types available is fostered by Elementor builder, the awesomeness of which is flawlessly enhanced by the indispensable JetElements pack. Within Elementor, it takes just a few clicks to add custom widgets, shortcodes, toggles, raw HTML and much more. Needless to say, precise documentation and 24/7 reliable support help you get through template customization facing no single obstacle. 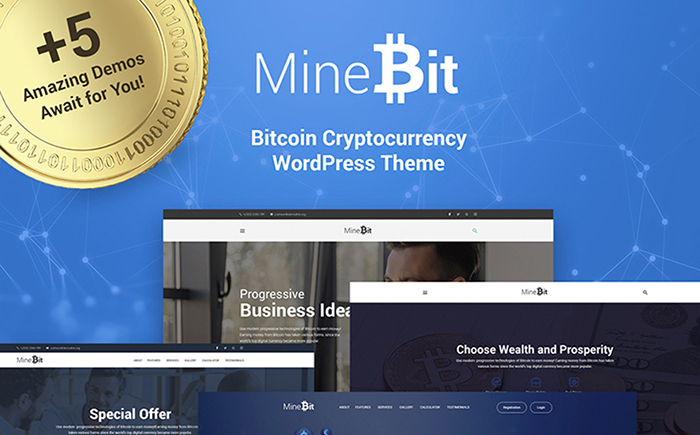 MineBit is a paramount candidate to get your cryptocurrency blog going with flying colors. This template brings you not one, but 5 impressive homepage demos, each absorbing the winning elements of a certain web design style. On top of Elementor and JetElements, MineBit motivates you to power an unbeatable UX using CherryProjects, Booked Appointment, Mega Menu, TM Timeline and other value-packed plugins. What’s more, MineBit is the template that speeds up the finalization of your project with its value-laden pack of ready-made cryptocurrency website pages. Leaving your competition far behind and making it to prominence is an obtainable goal with the CryptoHyb theme. This theme is Visual Composer compatible, meaning that you can tweak every box and block of it using this highly intuitive and comprehensive visual editing tool. Moreover, it’s highly beneficial that this template comes with electronic commerce functionality underpinned by the leading-edge WooCommerce plugin. WPML support is another template’s point of attraction as it allows you to effortlessly localize every string of text on your website. 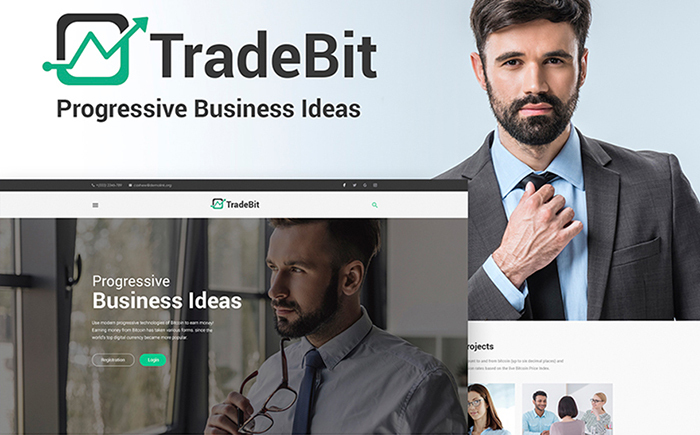 The next inimitable item in our list is the UI- and UX-brilliant TradeBit theme. With its flawless design, you cryptocurrency ambitions will face no limitations and rely on the sound base of loyal clients. TradeBit theme greets your site guest with an ultimate attention-grabbing treat, i.e. the CTA-buttons-enhanced top slider. What’s more, the template provides you with the mold for every site page you may need, as well less lets you make the choice of header and footer layout pre-sets on your own. 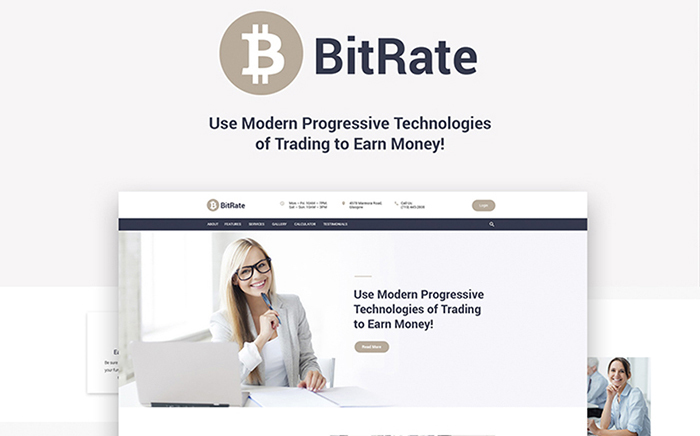 You’re more than welcome to tap into new progressive technologies of online cryptocurrency trading with the imperfection-free Bit Rate template. This theme is far from looking unprofessional and blunt. On the contrary, its calm and clean design submerges visitors to the ambiance of modern web design and uniqueness. Commenting on the theme’s feature, we can’t help mentioning such advanced custom-tailored plugins as Cherry Projects, Cherry Pop-Ups, Mega Menu, WordPress Social Login, Elementor and Live Customizer. Moreover, it’s hard to overestimate the user-friendliness of this theme, as the customization experience it fosters is second-to-none. 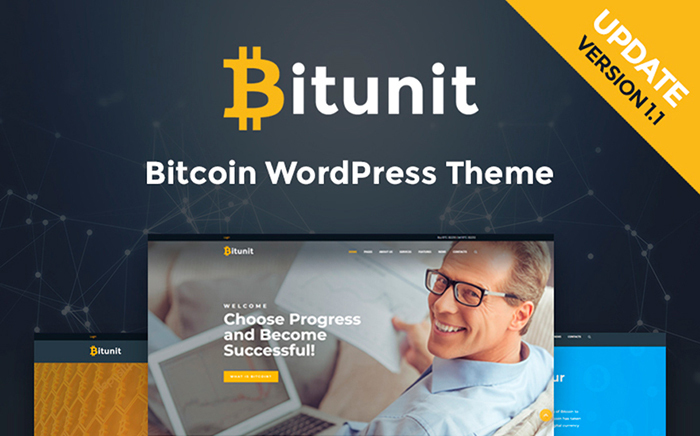 One of the most progressive template design studios on the web is happy to present you it’s next brainchild, the UX-first BitCrypt theme. This template has a statement-making juicy design that adds a lot to your brand identity and makes your business recognized among others. You’ll be amused by the multi-concept new-age design elements, more than 100 of which are included to Bitcrypt as a bonus. Screen resolutions of site users are also of no concern to you as this theme adapts to any of them in a jiffy. On top of this all, with Bitcrypt, you’ve got more than 550 fully adjustable options in your hand. 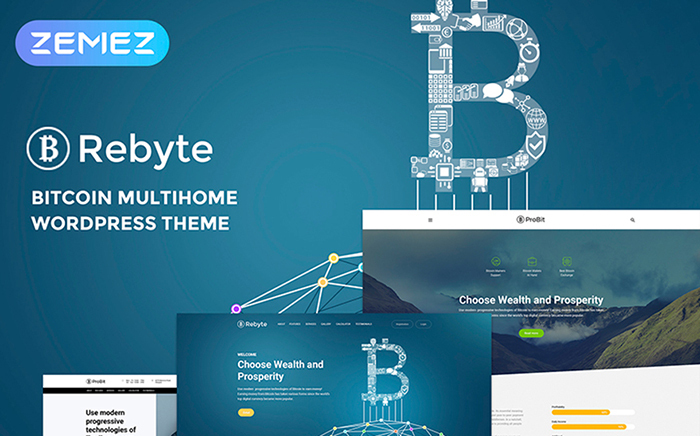 Rebyte is a canonical digital currency template powered by the professionalism-led ZEMEZ team that produces templates since 2004. On top of impressive, classy and readable UI, this template features polished-to-perfection SEO optimization. Built in full adherence to the latest search engine methods, Rebyte theme marries its valid, breach-free core with elaborated SEO tweaks and extensive options. What’s more, you get 5 Rebyte homepages to choose from, JetElements pack to provide for most handy visual editing experience, a solid bonus images pack and way more! Dinarcek is a one-of-kind crypto-blog template that comes with some unique functionality to it. 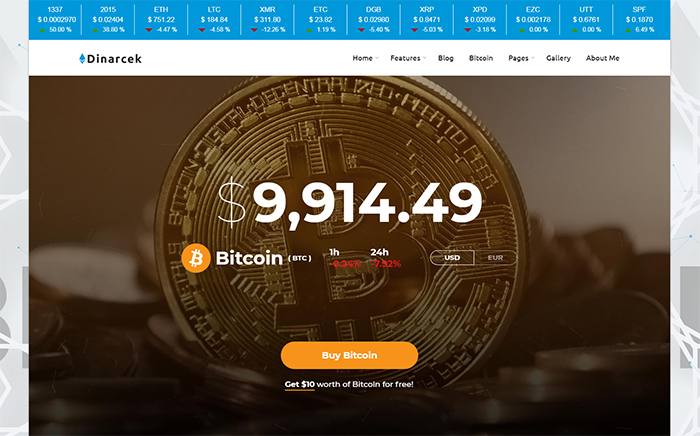 On the homepage’s top, you’ll easily locate the bar featuring cryptocurrency exchange rates. This bar adds informative value to your site’s UI and confirms your professionalism. With feature-rich Dinarcek, it will take just some hours or days to implement a Bitcoin (Ethereum, Ripple, Monero, Litecoin) website you’ve been dreaming about. This theme is limitlessly customizable, adaptable, flexible and extensible. Businessup is a mine of digital trustworthiness and a perfect touching point to introduce your business to the masses. The template brings your contact details to the top and makes sure they’re accessible on every page of your site. After installing your Businessup theme in 5 minutes, you’ll get a chance to feel the creativity flow with all the straightforward editing tools that the theme has on board. Moreover, both developers and non-techies will appreciate the extendible code base of this template making it a joy to customize and enhance. Do you procrastinate jumping on your first website design endeavor as you lack experience? You can catch up and get down to practice with the free Bitunit Lite design that’s kindly offered to you by ZEMES team with educational purposes in mind. Fortunately, this free theme is not stripped to the basics. It lets you try Elementor, play around JetElements, enjoy Live Customizer, install WooCommerce and a lot on top of this. All in all, you’ll hardly get your hands on a more advanced free theme in the market! Congrats! You’ve reached the end of our roundup. 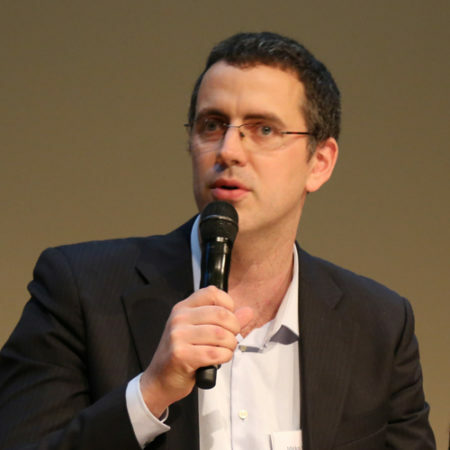 Now, you know what the pioneering themes that will dominate crypto-market in 2018 are. Fortunately, all of them have the full potential to become a core stepping stone to your online success. Meticulous documentation and fast-responding, approachable support will make your goal of powering a striking web presence with a premium WordPress theme attainable. We wish you good luck in this!